With the rapid growth in technology, it is becoming more easy for us to manage our homes using smart home tech. We find that investing in home tech such as smart bulbs and security cameras does not cost us much, compared to changing prior investments such as garage doors to make it smarter. 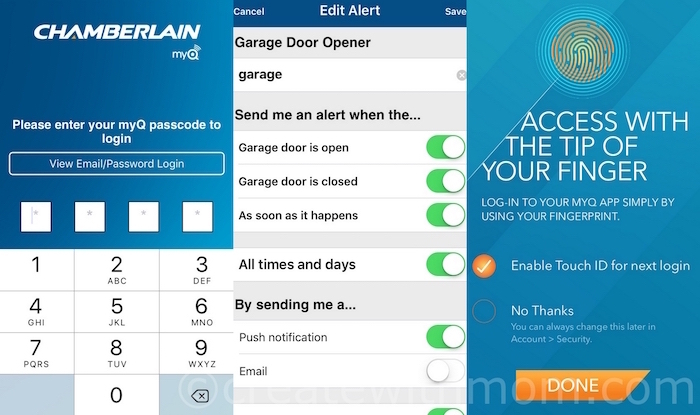 In order to make it more affordable for folks, Chamberlain has made an universal smartphone garage door controller that we can install to our already existing garage door at a fraction of the cost compared to if we were to change the entire door. MyQ is designed to make our existing garage door smarter! Imagine a scenario, when you leave your home and then you suddenly remember you left the garage door open – there is no need to panic or come back home to close it. We can now simply use the MyQ garage door control from our smartphone and close or open the door with the touch of our finger wherever we are! This choice makes it more convenient for us to be functional and easily manage our home. 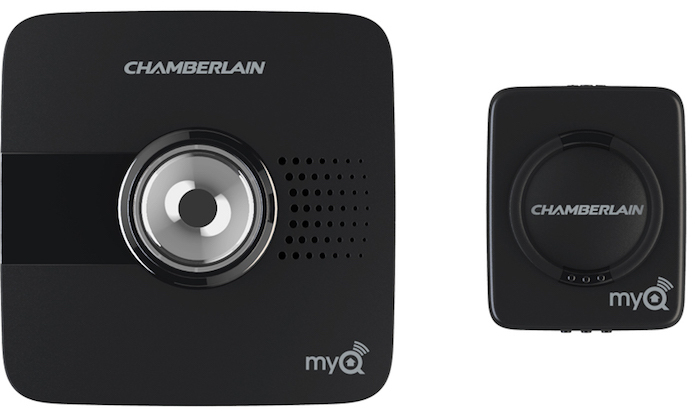 Chamberlain's MyQ smartphone garage door controller is compatible with most garage door openers, and can be added to our existing garage door opener that does not necessarily have to be a Chamberlain product. The MyQ technology works with a majority of garage door openers manufactured after 1993. Mount the bracket to the ceiling of the garage near the existing garage door opener and fasten the Wi-Fi hub. Attach the sensor to the top inside the panel of the garage door with adhesive strip. Download the MyQ Garage app and follow the instructions to set it up. The existing garage door needs to be sectional that roll up, rather than one piece that flip up. Doors need to have safety reversing sensors on the bottom of the garage door track for our own safety, which is usually standard in almost all garage doors. These sensors prevent the door from closing when something is blocking the door path. The garage needs to have decent Wi-Fi signal. We need to have an iOS or Android device such as phones or tablets. An extra electrical outlet next to the opener to power the MyQ. After the setup is complete, we need to install the free MyQ app to our smartphone or device. 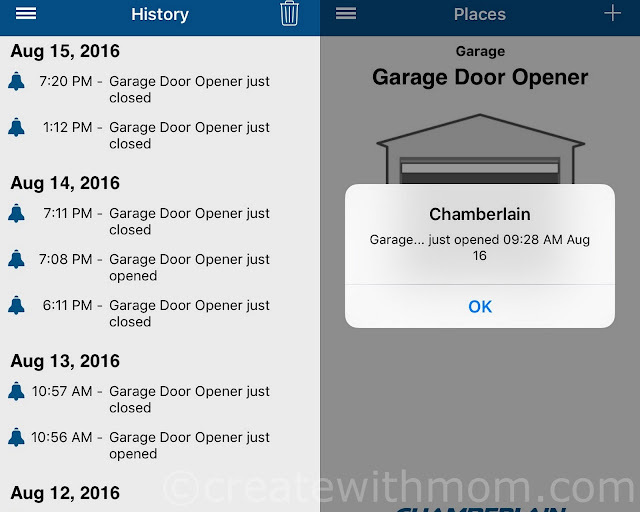 The app has useful features such as: it tells us if our garage door is left open, sends notifications to the phone when the garage door opens and closes. 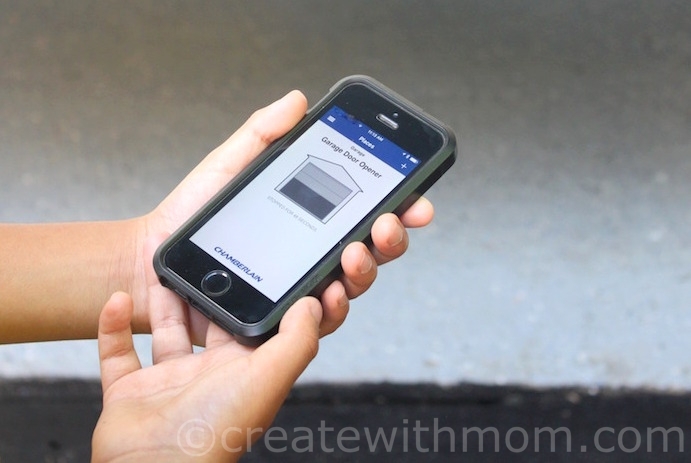 The best feature that we like is its ability to open and close the garage door anytime from anywhere in the world. Having the option to monitor the door is convenient such as knowing when the door was open and closed, or if it is left open. The Wi-Fi hub that comes with this kit picks up even the weak signals from the router, which was the case in our garage. 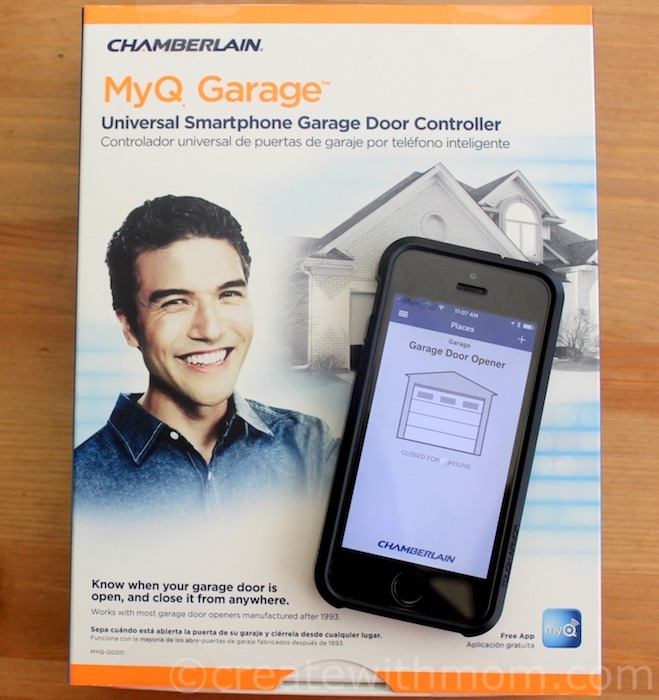 If you have a garage door opener that you purchased in the last few years, and want to make it smarter to control and monitor - then this Chamberlain MyQ Smartphone Garage Door Controller is a wonderful option that does not cost much. The kit includes the Wi-Fi hub, door sensor, mounting bracket for the hub, hardware for the Wi-Fi hub, Adhesive strips for the sensor, hardware for the door sensor, power cord for the Wi-Fi hub, and Quick Start instructions. It can be purchased at home improvements stores. That is a really great app! Really gives you peace of mind! This is so cool! There have been times we've forgot to check that the garage door went all the way down & we've turned around to double check, this would eliminate that need! This is a great idea and I will pass this on to my son because he can really use this!! Looks very cool!! Great for those with big garage doors! What a great app! I will show my kids this, they could really use this! 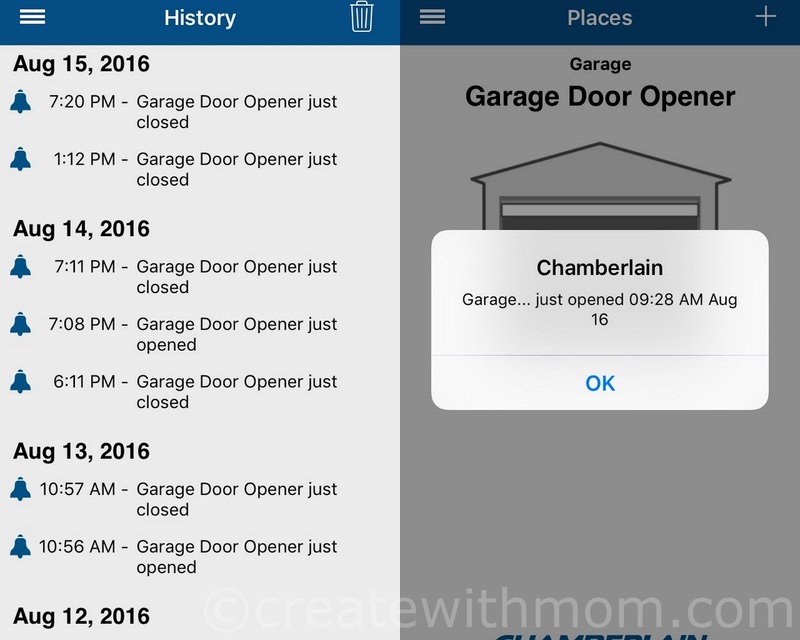 Wow, this is a terrific idea, love the alerts when the garage door opens, it's a great security feature. Sounds like an interesting product for those who have garages. This is what we have in our garage and it is excellent! This is super smart. I don't go in my garage much but Dh does and I bet he'd like this. Does it work with Android phones as well as apple? Oh my gosh I love this! We could really use this - my husband forgets to close the garage door often in the morning when he goes to work, and I often second guess myself when I leave too. This would give us peace of mind! And we have all the requirements we need for it to work, yay! We don't have a garage door so not something for us but i will pass this on to my daughter.Thanks for the great review ! This would be great if I had a smartphone. This is so amazing. I love technology is making things so much easier and giving us a piece of mind all at the same time. really great..but we do not have a garage door on this house! This would be totally awesome...but we don't have a garage. I wish we did.